Do you know what's coloring your strawberry yogurt red? I'll bet it is Dactylopius coccus costa. Or Carmine. Or simply insect. Yes. 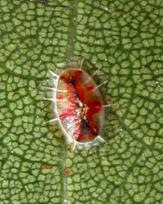 Dactylopius coccus costa is a bug that feeds on red berries which accumulates in its belly. The red berries give the Carmine the reddish color. So, a food manufacturer will have to simply grind these dried Dactylopius coccus costa, turn it into a fine, red powder, and sprinkle it over your supposed to be red, pink, or purple food products! Oh, I love processed foods!